Breeds: The Dog Name Game / 4 Pics 1 Dog / What’s the Dog? – The favorite ‘Guess the Word’ game of dog lovers. Do you REALLY LOVE puppies & dogs? 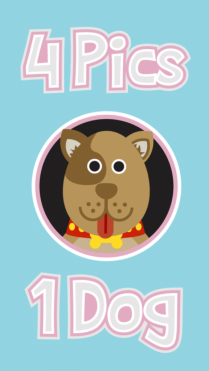 Can you name each kind of dog in this fun "4 pics" guessing game? 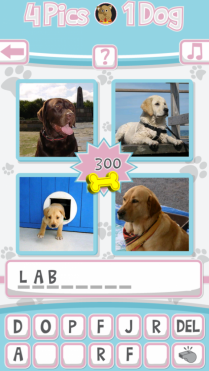 • 4 Pics 1 Dog also known on other platforms as What’s the Dog? 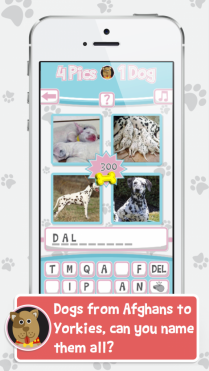 or Breeds: The Dog Name Game is a challenging word game about man’s best friends. The game presents 4 unique pictures of one in over 100 breeds of dogs for players to identify just what kind of dog it is. Of course many dogs will be simple guesses for true dog lovers and say…vets, but there are some breeds out there that may be not so easy to figure out. 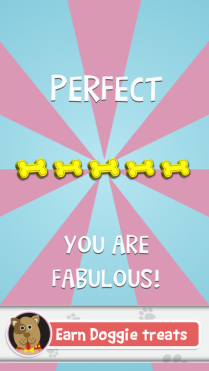 • During the research phase for this game we noticed that many people subconsciously identify what kind of dog they see as they walk down the street. It’s almost second nature if you think about it (you probably do it too)… is it a dalmation?, a poodle?, a pitbull?. Maybe it is because knowing the type of dog will help determine whether it is safe to play with or not. So whether this game appeals to the dog walker, or dog owner, or the 5 year old dog lover, it has proven to be a game that is enjoyed by many. • Simple enough to fire up while waiting for the train or bus…or for a quick round or two at bed time, its a fun brain teaser with cute dogs too. And who doesn’t love cute dogs? Download 4 Pics 1 Dog / What’s the Dog from any of these stores!